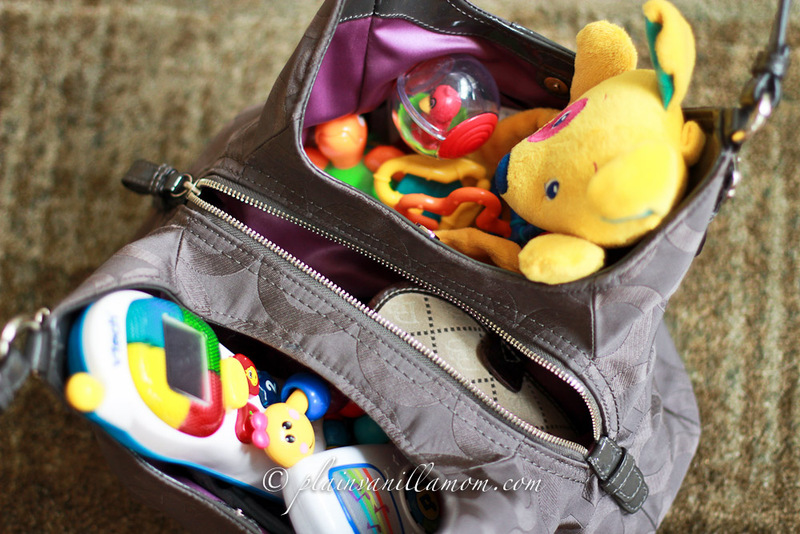 I don’t know about you, but now that we’ve got a little one again, whenever I leave the house my purse looks like this! Even if it’s just a quick trip to the post office. Ugh… I load it up every time I leave the house only to have half of the contents remain in the car and stroller anyway. So, here’s my genius idea! C is starting to outgrow and get bored with some of his smaller ‘baby’ toys. I was am really having a hard timing packing them away parting with them. I guess this mama is not quite ready to move onto the next phase yet. So, I have been wracking my brain to figure out a way to put them to good use. I think I’ve figured it out. After seeing a couple of posts from a few good blogging buddies I was inspired! I decided to take some empty baby wipes cases, which the babycakes loves to play with anyway, and repurpose them. I filled them with a variety of the small toys in question and gave them a new home in the car. This is working fabulously!! He still finds them interesting when they are the only things to play with lol! We just have so much at home I guess they get overlooked when tossed in with his other toys. This gives them new life. Everything has a place, and I no longer have to stuff my purse before leaving the house. 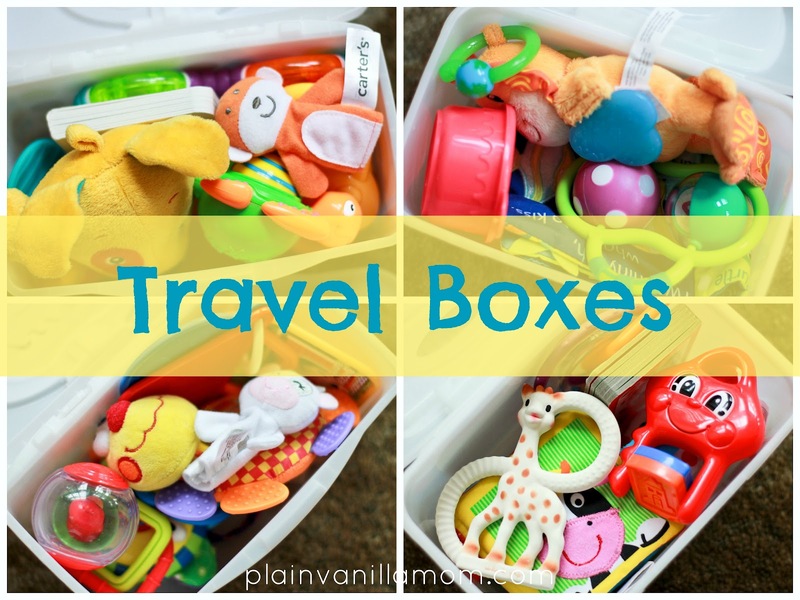 The travel boxes permanently reside in the car so no more lugging toys back and forth! As C gets older I’ll have to change out the contents of the boxes a bit but for now it’s perfect. The old toys are put to good use, C is entertained in the car and I didn’t have to part with that piece of his babyhood yet. Everyone is happy, including my overstuffed purse… (at least for now). Some of what I put in the boxes includes various teething rings, small books, small stuffed animals, rattles, small balls, and finger puppets. I still have a bin full of more of these types of things in the house so if he starts to get bored with any of the boxes I can easily rotate the contents. I would be remiss not to share with you the links I gained inspiration from…. 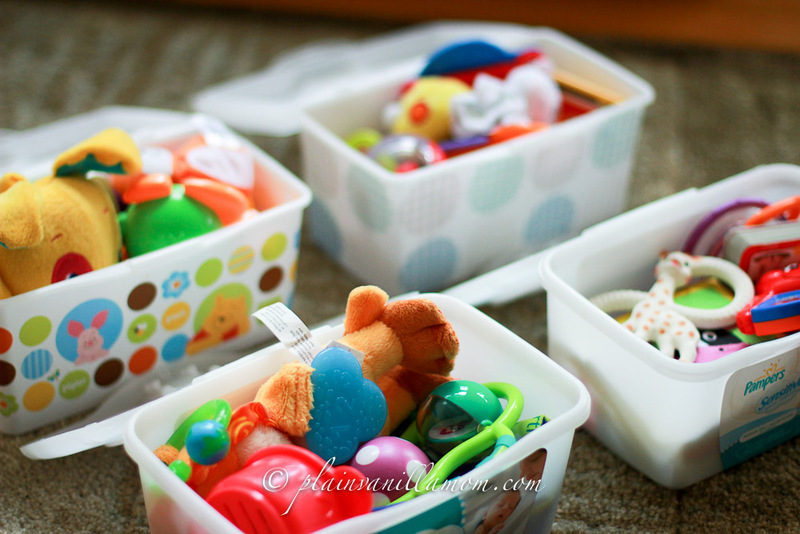 My good friend Amanda over at Dirt & Boogers recently did a great post on Getting Your Car Organized. It is a MUST READ! You won’t believe the amount of tips she’s packed into one post. Famiglia & Seoul recently made Travel Sensory Bins (which I love)! They would be fantastic if your child is a little older than my C.
If you liked this post, don’t miss another! We would love to have you Follow us on Facebook and Twitter for more fun and ideas!! We love meeting new friends! This is so smart! Def adding this to my travel packing list. Thank you!